Hardinge® HCAC® Collet Adaptation Chucks will adapt most spindles to accept C-series pull back collets, J-series pull back collets, stationary B-series collets, style-S master collets, step chucks & closers and dead-length® collets. 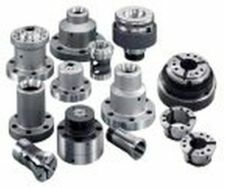 It is possible to increase your machining capabilities by substituting a collet chuck over a jaw chuck for part diameters up to 6 inch depending on the spindle size. Another style of Hardinge collet adapter is their quick-change FlexC™ Vulcanized Collet System that provides collet changeover in seconds using a manual compression wrench. The FlexC collet system has a guaranteed accuracy within .0004" (.010mm) TIR for both collet system styles A (pull-back stationary stop) and D (pull-back thru-hole) and .0008" (.020mm) TIR for style DL (push-to-close dead-length®). The collet head has a generous gripping range to allow variation in bar stock without having to change the collet. Because there is no collet body, the collet segments will remain parallel to the stock even when there are variations in the bar stock. This parallel clamping minimizes stock "push back" that could create inconsistent part lengths. The spindle mount will fit on A2-5, A2-6, A2-8 and some flat back spindles (main and sub).